Nearly 3 million people live in close proximity to Mount Vesuvius, which infamously erupted in A.D. 79, burying the prosperous towns of Pompeii and Herculaneum. Researchers agree that it is not a matter of if Vesuvius will erupt again, but when and how violently. The Italian government is even offering 30,000 Euros to anyone living in one of the 18 towns in the immediate area who is willing to move out of the area. Meanwhile, volcanologists are reconstructing the volcanos past to better predict just what might happen when it blows its top again. Close to 3 million people live near Mount Vesuvius, which has erupted explosively eight times over the last 17,000 years, including the A.D. 79 eruption that destroyed Pompeii and other towns. Researchers are studying the volcano to figure out what might happen when Vesuvius erupts again. Photo by Dan Dzurisin, 1983, U.S. Geological Survey. Mount Vesuvius has a varied history, sometimes going thousands of years between eruptions, and sometimes going just a few years. Sometimes, like in A.D. 79, the eruptions have been explosive; while at other times, the volcano peacefully effused lava. Furthermore, the pumice composition in each of Vesuvius major eruptions has been slightly, but significantly, different, says Dan Morgan, a volcanologist at the University of Durham in the United Kingdom. Thus, he says, determining what is typical and likely future behavior at Vesuvius is exceedingly difficult. It is those questions that a new model, developed by a team led by Andrea Borgia, a volcanologist at the European Development and Research Agency in Rome, tries to answer. According to Borgia et al.s model, published in the Feb. 2 Geophysical Research Letters, a strong Strombolian eruption  a voluminous lava fountain with occasional explosions  is the most likely type of eruption to occur at Vesuvius in the short-term. This type of eruption is not as risky to people living in the area, Borgia says, because there is usually ample time to get out of the way of the lava flows. An eruption that presents a larger risk but is less likely to occur is the Plinian type  named for Pliny the Younger, who witnessed the A.D. 79 eruption of Vesuvius and provided the first-ever written account of a volcanic eruption. This violent, explosive eruption sends plumes of hot gas, ash and rock tens of kilometers into the atmosphere and cascading down the mountainside in the form of pyroclastic flows. The evacuation plans and hazard assessments at Vesuvius are based on Plinian or sub-Plinian eruptions, which pose a different hazard than large Strombolian eruptions, Borgia says. The problem is our model shows that it is very probable that the next eruption will be Strombolian, with large, destructive lava flows, Borgia says. Based on geologic and structural data and synthetic aperture radar images, the model indicates that eruptive activity at Vesuvius can be characterized by three phases. From 25,000 years ago to 18,000 years ago, the volcano was building its edifice up with large lava flows (mostly Strombolian eruptions). The second phase, from 18,000 years ago through the A.D. 79 eruption, involved the accumulation of gas-rich magma beneath the volcano that led to explosive Plinian eruptions. During the third phase, beginning after the A.D. 79 eruption and continuing through the next 7,000 years, Borgia says, the volcano spreads  creating subsidence on the summit area, new ridges around the base (Pompeii is actually built on one of these ridges) and occasionally fractures and large lava flows, but no more Plinian eruptions. Since the A.D. 79 eruption, the explosivity of eruptions  the most recent being in 1944  has decreased, Borgia says, and will continue to remain low. However, the trend of diminishing volcanic explosivity is perhaps a little more complex to interpret than the authors claim, says Morgan, who is involved in the ERUPT (European Research on Understanding Processes and Timescales in magma systems) program that studies Vesuvius and other European volcanoes. During what Borgia calls the spreading phase (over the past 2,000 years), two explosive eruptions have occurred, contradicting the model, Morgan says. Furthermore, the type of eruption also depends on the chemistry of the magma and the tectonics of the volcano. Vesuvius is a very complicated volcano, Morgan says. But large lava flows are certainly a possibility there, he says, as most of the area between the volcano and the sea has been buried under lava at some point in the past 400 years. If the past can predict the future, then generally, the longer the quiescent period at Vesuvius, the more violent the renewal of activity, say Morgan and others. 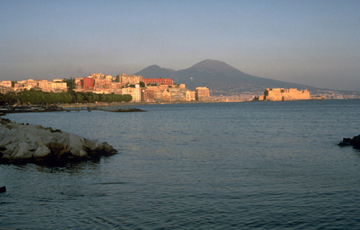 At the International Geological Congress meeting last summer in Florence, Franco Barberi of Rome University called Vesuvius the worlds most dangerous volcano, with a high probability of an explosive Plinian eruption by the end of this century on the order of the one that buried Pompeii.